I’ve been talking about eliminating foods, for those who want to do so in order to lead a healthier lifestyle (see Eliminating Foods Part I and Part II). In this post, I’m going to discuss the importance of replacing foods you are trying to eliminate and how to avoid letting your healthy changes turn into restrictive dieting. 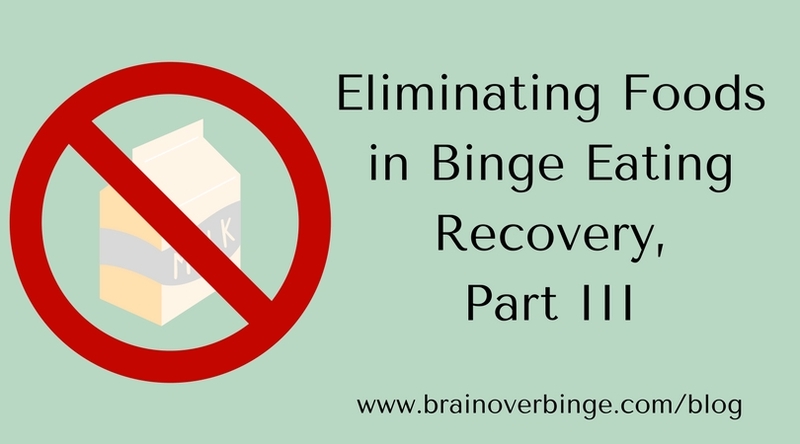 But first, I’m going to talk briefly about my own experience with needing to eliminate foods, something I addressed in Brain over Binge. Since I recovered over 8 years ago, I’ve gone through 4 extended periods of time that I’ve had to completely eliminate certain foods. My first child developed allergic colitis only several weeks after birth (a condition where the baby’s immune system overreacts to food proteins in the mother’s milk, which leads to irritation/inflammation, ulcerations, and even some bleeding in the colon). To treat this, I had to give up all dairy (and beef), wheat, soy, eggs, and nuts for several months. When I gave birth the second time, I hoped it wouldn’t happen again; but sure enough, when my daughter was a few weeks old she began developing the same symptoms. This time, I knew exactly what to do to help her, so I went on an elimination diet again; and within a couple weeks, her symptoms disappeared. For my 3rd and 4th babies, I didn’t even want to risk it so I stopped all dairy one month prior giving birth. My 3rd baby did fine, but my 4th(who is now 8 months), had some symptoms despite the elimination of dairy and there was about a 6-week period when I had to eat nothing but potatoes, turkey/chicken, olive oil, almonds, and some mild vegetables and fruits in order to clear up his digestive tract. (On a side note, all my children are fine now. An infant’s intestines are porous until around 6 months, which allows proteins to pass though; but when the pores start to close, their bodies gradually stop producing the adverse immune response. It’s not a true allergy, just a temporary protein sensitivity). I talked a little in Brain over Binge about how restricting my diet in this way didn’t cause any problem for me. It never felt like a “diet,” or like I was depriving myself (Ok, maybe I did feel a little sorry for myself sometimes as I watched the rest of my family munch down a pizza and I was eating my 3rd meal of sweet potatoes and chicken for the day:-)). Although it was inconvenient to have a lack of freedom around food, and it’s not something I’d want to continue for a long period of time; it wasn’t a bad experience at all. There was always a choice to put my babies on hypoallergenic formula, but that would have been costly and not as healthy for them. I chose to change my diet, and I felt like I was doing the right thing for my babies. In the same way, people who lead healthy lifestyles and nourish their bodies well with real food don’t feel “deprived” when they eliminate certain foods. They know they are doing right for their bodies, and they feel good doing it; and in all likelihood, they would actually feel “deprived” if they were forced to eat a diet consisting of a lot of processed, low-nutrient food. Wanting to nourish yourself well, and therefore avoiding foods that have no benefit to you, is much different than trying to force yourself to follow a bunch of food rules and starving yourself just so that you can lose weight. It is possible to make healthy changes (or even eliminate a certain food completely because it creates an adverse reaction) without it turning into a rigid diet; and sometimes the difference is simply in your mindset. I recently came across a book that does a wonderful job of explaining why there is no need to think in terms of rules, restrictions, and prohibitions when it comes to taking on a healthier lifestyle. It’s called Ditching Diets, by Gillian Riley. I’ve had a few of my own readers tell me that this book is helpful to read along with Brain over Binge, especially if a very healthy lifestyle is desired. Ditching Diets discusses some of the same concepts that my book does, but with a greater focus on helping you let go of the “dieting mindset,” and addressing lesser forms of addictive overeating (that gray area that doesn’t feel like a binge, but also not like you’d want to be eating). What I liked best about this book was how Gillian Riley drove home the idea that we all have free choice about what and how we eat, and everyone is capable of achieving freedom and peace with food – without solving emotional problems first. But, she also makes clear that having freedom with food doesn’t mean we’ll just be eating a bunch of junk all the time because we are free to do so. In fact, it’s quite the opposite: once we feel our free choice and give up dieting, we will be more likely to make better choices. I could relate to so much of what this book talked about, because I’ve experienced it. When I was dieting, I indeed felt deprived when I created a lot of food rules and avoided certain “fattening” foods (and I ended up eating much more of those same foods as a result of the deprivation). However, now, I don’t have the same reaction when I choose to avoid an unhealthy food (or when I gave up countless foods while breastfeeding). Without the dieting mindset, passing up a certain type of food doesn’t make me feel like I’m missing out on something, and doesn’t create powerful cravings. As you know from my book and other blog posts, I’m far from being a “perfect” eater (which doesn’t even exist because nutrition science is constantly expanding and changing). I eat unhealthy foods sometimes, but as Ditching Diets does such a good job of explaining, when there is a strong sense of free choice about how you eat (and you don’t feel out of control), choosing to eat less than ideal foods isn’t a problem – it’s simply a choice with certain outcomes you have to be prepared to accept. Yes, I choose convenience over nutrition when my life is busy; but yes, I also strive to nourish my body well as much as I can. This is a balancing act that everyone must manage, but it never has to be all or nothing, it never has to be perfection or binge. My kids love waffles (they like peanut butter and maple syrup on them, which I think is a bit odd, but they got it from their daddy:-)), and I slowly got into the habit of giving them processed, pre-packaged waffles too often. At the end of my 4th pregnancy and after my son was born in November, the older 3 kids ate the pre-packaged waffles every single day. I was so exhausted and sleep-deprived that I couldn’t find time or energy for anything better first thing in the morning, and it was the only easy breakfast that all of them liked. Around the end of 2012, my husband and I decided that we’d find a way to make healthy, homemade waffles so our kids could get a better start to their day. We experimented with some recipes and finally found something that worked – using eggs, coconut milk, coconut flour, baking soda, vanilla, cinnamon, and honey. The waffles are delicious! I make a big batch each week and I freeze them, so that the mornings are just as easy as when we bought the frozen Eggo waffles. If you asked my kids, I’m sure they would still say they like the “waffles from the store” better, but they eat up the ones I make. I know this is a simple example, but just keep in mind that there are enjoyable, healthier replacements for foods that you want to avoid.